"Helping retirees find a purpose in their golden years" - the line caught my attention while browsing the papers over breakfast one morning. It was an open invitation for Malaysians aged 50 and above to participate in the MIM-RAMLEA Life Enrichment program organized by the Malaysian Institute of Management (MIM) and supported by Konrad Adenauer Stiftung (KAS), Germany. It was right up my alley as I wanted confirmation of my life's purpose. I immediately sent in my application and was fortunate to be among the 30-odd men and women selected for the residential programme which ran from 16-19 October, 2008 at the Flamingo Hotel in Ampang. The Raja Mohar Life Enrichment Awards (RAMLEA) Programme is named after the late YABM Raja Tun Mohar bin Raja Badiozaman. who served as the second MIM President. 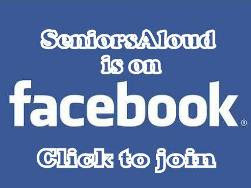 The program was launched in December 2004. This year marks the 5th batch of graduates of the program. It was an intensive four days of talks, discussions, field visits and fellowship, beginning at 8.30am with the first talk of the day, and ending at 10.30pm with a group discussion and reflection. The exception was Day 1 when the morning was given over to registration and arrival of participants from other states. The opening address was delivered by Ms Margaret Soo, COO of MIM. 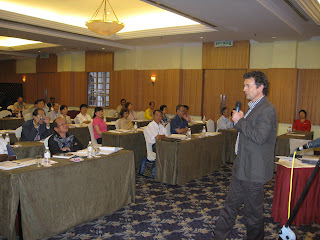 This was followed by a speech from Dr Thomas Knirsch, KAS representative to Malaysia. A note of appreciation to Dr Knirsch for taking time off his busy schedule to join the participants each day. 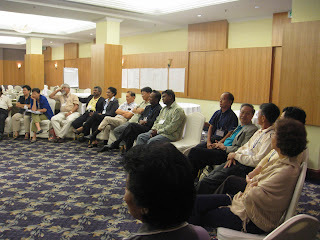 The program was chaired by Encik S. Hadi Abdullah and facilitated by Mr Dominic Joseph. Dr Knirsch addressing the participants. Sharing and reflecting on the day's learning. 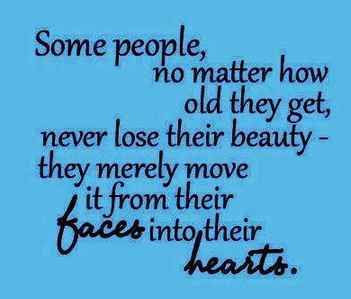 The particpants came from all walks of life. The common denominator was their age group. 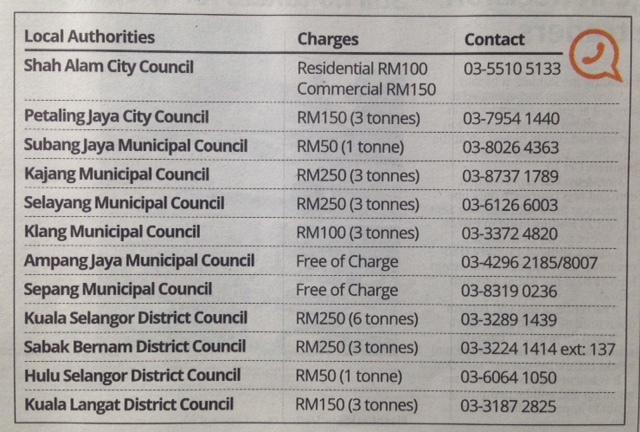 All were retiring or retired senior citizens, with the oldest aged 70. 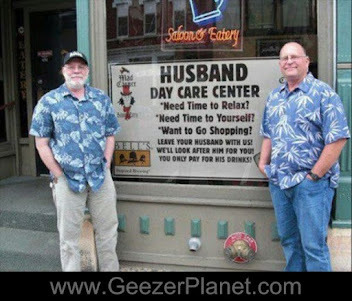 We were there probably for the same reason - to find out how we could render our services to society in our retirement years. To help us discover our purpose in life, the MIM-RAMLEA program raised our awareness in areas such as community development, environmental conservation and volunteerism. A week before the program started, participants were sent a collection of required readings centred on Universal Values and Human Renewal. These included extracts from the speeches and writings of world luminaries like Nelson Mandela, Mother Teresa, Hans Kung, Amartya Sen, Konosuke Matsushita and our very own Harun Hashim. I found the readings intellectually stimulating. To those wanting to work for the betterment of society, it was imperative that they understood universal values such as human rights, rule of law, and global ethics. We had group discussions to brainstorm each of the readings, and came up with a list of 15 universal values and 15 concerns that mattered most to us as fellow Malaysians. Top of the list for universal values (in no particular order) were integrity, love, compassion, understanding, respect, and wisdom. Corruption, disharmony, poverty, environmental degradation, injustice and indifference were among the main concerns. It made sense to me personally, that before we could even begin to help others, we should start with ourselves. Do we have the right mindset, the right attitude and the right attributes to embark on a mission to help the less fortunate in society? How serious are we in volunteering to help? Do we know enough of what's at stake? If our answer to all these questions is no, then our contribution in terms of our dedication, time and effort will not be sustained. To this end, the talks covered a wide range of topics. Ms Margaret Chang and Ms Masriah Dahlan introduced us respectively to the work of NASAM (National Stroke Association of Malaysia) and SALAM (Yayasan Salam Malaysia). The two presentations exposed us to the selfless work done by non-governmental organizations. 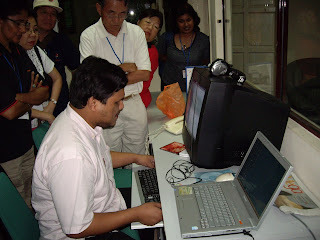 We also paid a visit to the Malaysian Association for the Blind (MAB). The latter was an eye-opener for many of us. 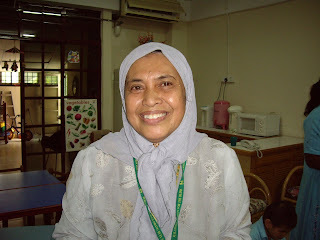 We wondered whether we had the same level of commitment and passion shown by Puan Rosnah Alimuda. She spent 35 years of her life teaching visually-impaired children to read, write and count using Braille. Emailing and enjoying online entertainment is not a problem. 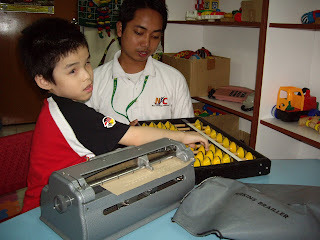 Participant Godfrey Ooi, who is also MAB Deputy Executive Director, reading from a Braille book. 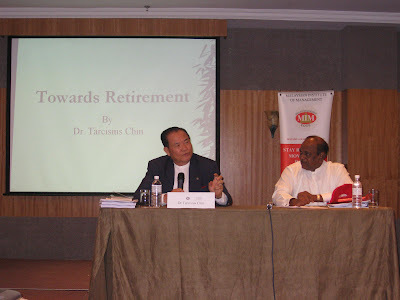 Dr Tarcisius Chin, former CEO of MIM, spoke on how to prepare for our retirement. This included advice on healthy living, a topic that was expanded on by Ms Doreen Ong in her talk "Your Body, Your Health". Participants were given a basic test to check their vital statistics for optimal health. Imagine our shock when we were told that the majority of us (including the thinnest) were classified as obese! It was truly a wake-up call for us to take better care of our health. 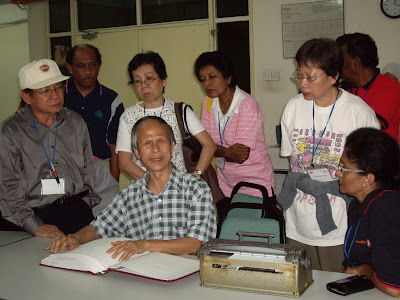 Dr Tarcisius Chin (left) and Encik Hadi Abdullah. ARE FILIAL CHILDREN A DYING BREED?